A 20-year-old woman, Rafiat Oseni, has been brought before an Ebute-Meta Magistrate’s court for allegedly killing her day-old baby by flushing him down a public toilet. The incident happened at Alaba Rago Market, Ojo area of Lagos State. It was learnt that Oseni, who hails from one of the Northern states in the country, worked as a sales girl in the market and had entered the toilet pretending to ease herself. She was said to have forced the baby into the toilet, but the baby got stuck in it. He died as people were attempting to rescue him. The magistrate, Mr Olanrewaju Olatunji, in obvious shock, asked the suspect why she decided to kill her own child. Instead of responding, Oseni burst into tears and pleaded for forgiveness. Olatunji then called the Investigating Police Officer, Woman Corporal Veronica Uket, who narrated the incident. She said, “Oseni went to the public toilet on January 3, 2014 around 2.30pm. She was said to have pretended that she wanted to ease herself. “She came out and nobody suspected anything. When she left, the baby started crying. It was another woman who wanted to use the toilet that first saw the child and called the attention of the woman in charge of the public toilet. Uket said the suspect could not be found on the day of the incident, but she was caught the following day when she showed up again in the market for work. She was subsequently handed over to the police who arraigned her on Wednesday on one count of murder. The police prosecutor, Inspector Richard Odigwe asked for the remand of the defendant in line with Section 264 of the Administration of Criminal Justice, Lagos State Nigeria, 2011. Odige added that the remand would help the police obtain legal advice from the Directorate of Public Prosecution. The magistrate agreed to remand the defendant in the Ikoyi Prison pending legal advice. The matter was adjourned till March 10, 2014. Some ladies are busy throwing away their babies while others are praying to have one. The yoruba will call HIM Oba Aseyiowu. If not that he does things in His ways, some women should die barren instead of wasting the precious gifts some are dying to behold. The idiot should be severely dealt with. Kikelomo u re right he is really Oba Aseyiowu if not dat something I ve been praying n begging God 4 nine year now. And God gave her on a plater of gold n wat she tink is best 4 d baby is 2 flush him in d toilet. Well I will not curse her bcos d curse has pronounce it self on her may God ve mercy on her. And she had the baby peacefully and successfully without the help of any doctor. She didn’t even treat her self and just resumed work the following day as if nothing significant happened. God, You are unquestionable, great and mighty is Your name. Please grant as many that are looking up unto You for the fruit of the womb their heart desires in Jesus name. She carried dat baby 9months in her womb n she did nt kill him, why nw? I fink she’z highly possesed. A human dat cant even create a finger talkless of giving him dat breath! Why didn’t u drop him @ da orphanage home? U r mean n wicked, da law must take itz course or beta still sentence u by hanging! U r da very worst fool av eva seen!! some people are heartless.the same happened on Thursday at Benson. Shld we say she is mad or what? 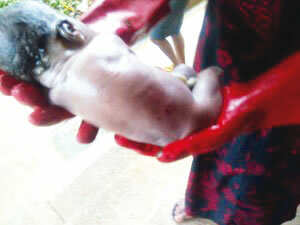 even a mad woman will not do this to her baby, carrying him for 9 mnths.